Earlier I wrote about my experience on Australian TV. They’ve put the clip up on The Morning Show website but they don’t allow direct links or have an embedding feature, so I did some digging in the JS/Flash code and put it below. 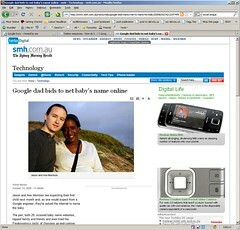 They put in a photo montage so some of my family, friends, and co-workers are famous in Australia too. If anyone wants to know how to embed videos from this site or other Yahoo TV sites, let me know and I’ll post more details. They really ought to just stick each video on it’s own URL and add some embed widgets. It’s not too hard to do, and it’s part of the reason YouTube became so popular.